(CNN) -- The mood at Hong Kong's Metropark Hotel was subdued Thursday -- but only because most of the guests were in their rooms nursing hangovers from a night of partying the evening before. 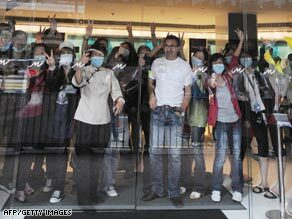 Quarantined guests and hotel employees wave through the glass at Hong Kong's Metro Park Hotel. And with good reason. For seven days, the 200 guests and 100 staff members at this modest business hotel in the Wanchai bar district have been in involuntary confinement after health officials determined that a guest there had contracted swine flu. But in another 24 hours -- at 8:30 p.m. Friday to be precise, as guests kept reminding themselves -- they would be free to leave. "Last evening, people perked up a bit," said Kevin Ireland, an Indian national. "We're cheerful. We're happy we're getting out tomorrow." For most of the guests here, it was a case of being at the wrong place at the wrong time. They picked the same hotel as a 25-year-old guest from Mexico who tested positive for the H1N1 virus. And Hong Kong health officials -- unwilling to see a repeat of the SARS epidemic in 2004 that killed nearly 300 people -- placed the hotel on lockdown. That was last Friday night, when Ireland was headed out to grab some Italian food with friends but hotel staff stopped them at the door. Most stayed cocooned in their tiny rooms, flipping through channels on the television or staying connected with their work colleagues via Internet chats. With no pool to lounge by and just one restaurant to pick from, guests milled about in the lobby to pick up food or get their temperatures taken once a day. "We go down to the lobby for food and then back to the room to eat your food," said Leslie Carr, a British man. "Not many people are downstairs hanging around to talk or discuss anything." Outside, bars and clubs lay only a short walk away. But police in face masks stood guard at the door, barring exit. Packs of reporters and camera crews peered through the hotel's glass windows. The British contingent organized a quiz night once. When a French national had a birthday, the country's consulate sent wine and champagne. The Hong Kong government, itself, tried its best to make living arrangements as comfortable as possible. They delivered a box of chocolates to guests, comped their rooms and offered them free long-distance phone calls. But food was a constant complaint. Guests, tired of hotel fare, were allowed to order take-out -- a boom in business for area eateries. "A tribal instinct sort of manifested itself," Ireland said. "You get into linguistic groups. You hang with people of the same country and region." Mark Moore, a British national, spent many hours kicking himself for changing his plans at the last minute -- the day before the quarantine. He was scheduled to fly home at the end of a business trip, but decided to spend the weekend visiting friends and family in Hong Kong. "I wish I'd left the day before," Moore said. "I definitely wish I'd gone home a day early." Tempers sometimes flared. Guests questioned the point of a quarantine when they were allowed to flout health safety recommendations. Many walked around without the blue surgical masks they were expected to cover their mouth and noses with. Each also had to take a 10-day dose of anti-viral medication. None have tested positive for the virus. "We were all using the same elevator when we knew the virus can spread through touching objects," Ireland said. "The health workers worked in shifts. I don't know if they go home or to some other place where there's some sort of quarantine. And we're handing money to pay the people outside bringing our food. I'm not wearing gloves, the guy on the outside's not wearing gloves." Hong Kong's Chief Executive Donald Tsang publicly apologized to the guests but said the precautions were needed. "In view of the lack of data ... we have to be very cautious," added Yuen Kwok-Yung, a professor of microbiology of Hong Kong University. "I believe that as time goes by, we can change our strategy." By Thursday, many guests said they have paid their bills and packed their bags. All there was left to do is stare at the clock ticking away toward their release.